4x4 Pennsylvania 6600 Floor Scale 10,000 lb.They don't make floor scales like this overseas. The 48"x48" mild steel painted Pennsylvania M6600 10,000 lb 4x4 floor scale is a great choice for any warehouse. 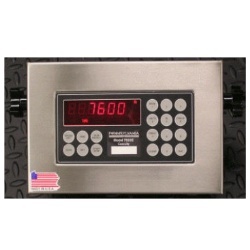 Comes with a Pennsylvania 7600+ digital indicator for a Complete Scale System factory calibrated -- ready to use immediately when you receive the scale. NTEP. Price includes the Freight in cont'l US business addresses only (Zoned Commercial) with a loading dock or forklift. 4x4 Pennsylvania 6600 Floor Scale 1000 lb.Versatile 48"x48" painted Pennsylvania M6600 floor scale is a great choice for any warehouse. 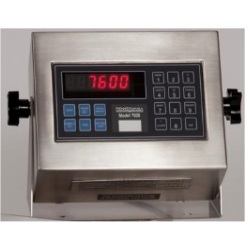 Comes with a Pennsylvania 7600+ digital indicator for a Complete Scale System factory calibrated ready to use immediately when you receive the scale. The structural steel design withstands years of heavy industrial use. NTEP Capacity is 1000 lbs. Price includes the Freight in cont'l US business addresses only (Zoned Commercial) with a loading dock or forklift. 4x4 Pennsylvania 6600 Floor Scale 2000 lb.48"x48" 2000 lb. mild steel painted Pennsylvania 6600 floor scale is a great choice for any warehouse. 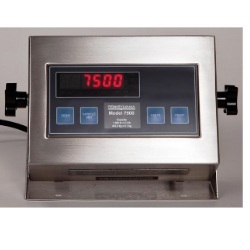 Comes with a Pennsylvania 7600+ digital indicator for a Complete Scale System factory calibrated ready to use immediately when you receive the scale. NTEP Approved Capacity: 2000 pounds. Price includes the Freight in cont'l US business addresses only (Zoned Commercial) with a loading dock or forklift. Pennsylvania 6600 5x5 Floor Scale 10,000 lbThis versatile 5'x5' mild steel painted Pennsylvania 6600 American Made floor scale is a great choice for any warehouse. Comes with a Pennsylvania 7600+ digital indicator for a complete system factory calibrated ready to use immediately when you receive the scale. Capacity: 10,000 pounds, best of all this price includes the Freight in cont'l US business addresses only (Zoned Commercial) with a loading dock or forklift. Pennsylvania 6600 5x5 Floor Scale 5000 lbThis versatile 60"x60" mild steel painted Pennsylvania 6600 American Made floor scale is a great choice for any warehouse. Comes with a Pennsylvania 7600+ digital indicator for a complete system factory calibrated ready to use immediately when you receive the scale. Capacity: 5000 pounds, best of all this price includes the Freight in cont'l US business addresses only (Zoned Commercial) with a loading dock or forklift. Pennsylvania 6600 5x6 Floor Scale 5000 lbThis versatile 5'x6' mild steel painted Pennsylvania 6600 American Made floor scale is a great choice for any warehouse. Comes with a Pennsylvania 7600+ digital indicator for a complete system factory calibrated ready to use immediately when you receive the scale. Capacity: 5000 pounds, best of all this price includes the Freight in cont'l US business addresses only (Zoned Commercial) with a loading dock or forklift. Pennsylvania 6600 6x6 Floor Scale 10,000 lbThis 6'x6' mild steel painted Pennsylvania 6600 American Made floor scale is a great choice for any warehouse. Comes with a 7600 Plus digital indicator for a complete system factory calibrated ready to use immediately when you receive the scale. Capacity: 10,000 pounds, best of all this price includes the Freight in cont'l US business addresses only (Zoned Commercial) with a loading dock or forklift. Pennsylvania 6600 6x6 Floor Scale 5000 lbThis versatile 72" x 72" mild steel painted Pennsylvania 6600 American Made floor scale is a great choice for any warehouse. Comes with a Pennsylvania 7600+ digital indicator for a complete system factory calibrated ready to use immediately when you receive the scale. Capacity: 5000 pounds, best of all this price includes the Freight in cont'l US business addresses only (Zoned Commercial) with a loading dock or forklift. Pennsylvania 7500+ Digital IndicatorAn economical choice in material handling and shipping and receiving applications, the Pennsylvania 7500+ digital weight readout is a practical indicator for floor and bench scales. Stainless Steel enclosure. Counting function. Easy 4 button operation. NTEP Approved. 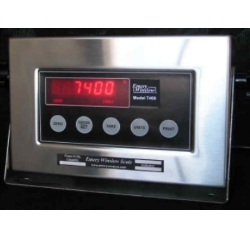 Pennsylvania 7400+ Digital Weight Indicator7400+ has simplified 5-Button front panel. Designed for direct replacement for many existing UMC-series applications; dual independent RS-232 outputs, for example drive both scoreboards and printers or data processing systems. 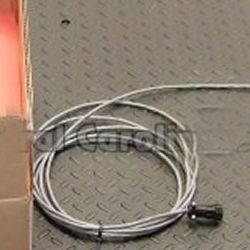 Pennsylvania Scale Home Run CableInterface Cable (Home Run Cable) - 20’ cable. Quick disconnect to the indicator on one end with tinned leads on the other. Just replace color-for-color at the base end. Works with Pennsylvania 7500 or 7600 digital indicator. Pennsylvania 7500-10 Heavy Duty Count ScalePennsylvania 7500-10 counting scale with 10 pound max capacity features simple 4 button keypad for easy counting. Ideal for: Shipping or receiving verification, Inventory or production control, Powerful and flexible std. RS232 data link. Heavy duty cast construction, not plastic like you see in material handling catalogs. Pennsylvania 7500-100 Heavy Duty Count ScalePennsylvania 7500-100 counting scale with large 100 pound max capacity features simple 4 button keypad for easy counting. Ideal for: Shipping or receiving verification, Inventory or production control, Powerful and flexible std. RS-232 data link, Heavy duty cast construction, not plastic like you see on material handling company websites. Pennsylvania 7500-150 Heavy Duty Count ScalePennsylvania 7500-150 counting scale with large 150 pound max capacity features simple 4 button keypad for easy counting. Great for Inventory or production control. 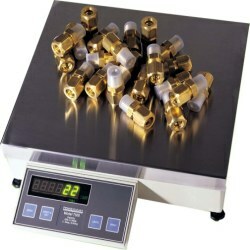 Heavy duty scale designed for years of use in your warehouse. Pennsylvania 7500-2 Heavy Duty Count ScaleNot many manufacturers make counting scales like the heavy duty Pennsylvania 7500-2 counting scale with 2 pound maximum weighing capacity features simple 4 button keypad for easy counting. Great for sampling small lightweight items. Pennsylvania 7500-20 Heavy Duty Count ScaleCounting Scales with 20 lb. max capacity are built everyday at the Pennsylvania Scale Factory in Lancaster. 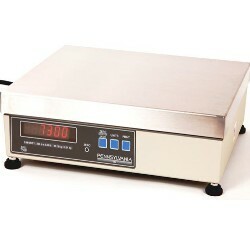 Pennsylvania 7500-20 counting scale with 20 pound maximum weighing capacity features simple 4 button keypad for easy counting. Pennsylvania 7500-5 Heavy Duty Count ScaleCount and weigh small parts with ease using the Pennsylvania 7500-5 counting scale with 5 pound max capacity. 4 button keypad for easy counting. Sometimes less buttons equals simple and easy to use. Great for sampling smaller, light weight items. Pennsylvania 7500-50 Heavy Duty Count ScaleVery popular counting scale. The Pennsylvania 7500-50 counting scale with 50 pound max capacity features simple 4 button keypad for easy counting for your annual inventory count. Made in USA designed for years of industrial use.